Image courtesy of NCSU CES. The control of stem blight depends on cultural practices; fungicides do not provide adequate protection. Having a clean planting stock is the first step to establishing a disease-free planting. Plants grown from tissue culture are usually the most disease-free, followed by those from softwood (summer) cuttings. 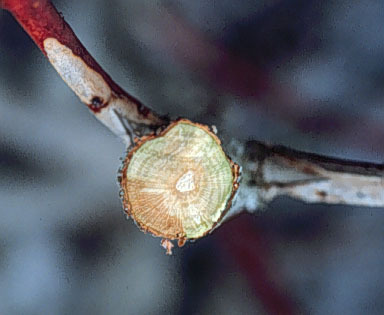 Plants rooted from hardwood (winter) cuttings are more likely to be diseased because the cut end (wound) at the top of the cutting is more likely to be exposed to infection. Where rooted cuttings are used, cull plants to remove weak or diseased cuttings. If possible, grow the plants for a year in a nursery row or in pots before planting in the field. Pruning to remove infected stems is the best method of reducing spore production by Botryosphaeria in established plantings. Infected stems should be removed from the field and destroyed (burned or shredded). Manage fertilizer inputs to prevent the formation of succulent shoots late in the growing season. Succulent, rapidly growing shoots that occur in late fall are injured by freezing temperatures and, subsequently, are infected by the stem blight fungus. Fertilizer should not be used after midsummer, especially on young bushes. New plantings often can be established without the use of fertilizer on soils with a natural high organic matter content (greater than 5 percent). Avoid susceptible cultivars when establishing new plantings. Most recently-released blueberry cultivars have some resistance to stem blight. Those that have a history of stem blight problems include Bluechip, Duke and Misty. Site selection when establishing new plantings appears to play a part in the severity of stem blight. The worst cases of stem blight in commercial fields occur on extremely sandy soils, resulting in drought stress, or on black, heavy muck soils, which promote excessive growth. Both of these conditions (drought stress, excessive growth) can predispose plants to stem blight. Avoid unnecessarily wounding of the bushes. Because stem blight is most damaging to young plants, heavy pruning to promote rapid growth should be avoided in 1- to 2-year-old plantings. Pruning in young plantings should be limited to fruit removal or thinning and removal of stem blight-infected canes. Wounding also can occur when herbicides are improperly applied. The use of shielded sprayers for herbicide applications will help prevent chemical injury to low branches. In some recently cleared fields where old stumps, trunks and branches have been left buried in the field, termites have been observed to wound and even kill new bushes. This can be avoided by thoroughly preparing fields before planting. Cline, W.O. Stem Blight of Blueberry, Fruit Disease Information Note 9. Retrieved from http://www.ces.ncsu.edu/depts/pp/notes/Fruit/fdin009/fdin009.htm. 05.20.2010. Photo from the NCSU Cooperative Extension Service. Cross-section of blueberry stem, showing brown discoloration caused by the fungus Botryosphaeria dothidea.